Creates associative balloon entities for assembly components in Model Space and for their generated views in a Paper Space layout. Each balloon contains an index of the component in the associated BOM-table created by BmBom command. Balloons are created as Multileader entities using the current Multileader style. Create a Multileader style with the Content set to Block and adjust the Scale property to control the size of the balloon frame. Selects the component and sets the location of the arrowhead. Pick point to place balloon - pick a point. Hold down the SHIFT key to align the balloon with the previous one. Select a BOM table <Back> - Select the BOM-table or press Enter to proceed with the currently selected BOM-table. Predefined balloon styles from _BalloonStyles.dwg can be used, as well as any custom user-defined styles. Allows automatic placement of balloons on all components in a particular drawing view. select other Table - Allows selecting a different BOM-table in case multiple BOM-tables exist in the layout. placement Mode - allows select whether multiple balloons with the same values are generated or not. Select placement mode <All> [Unique/All]: - controls whether multiple balloons with same values are generated or not. Back - Returns to the previous prompt. 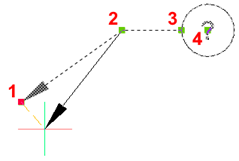 Align leaders along polyline: - select the next point of a polyline or press Enter to stop. Select the balloon in the drawing. For a single segment balloon entity, four grips display: Endpoint (1), Vertex (2), Landing (3) and Text (4). If move the arrowhead to a different component, the balloon automatically updates the position number according to the associated BOM-table. If the arrowhead hits a blank space, the question mark displays. BimTag - creates associative tags in generated BIM section drawings for the corresponding building entities in a 3D BIM model. BmBom - inserts a Bill of Materials (BOM) table in the current drawing. Ddedit - edits single-line text, multi-line text, attribute definitions, and attribute text. DimReassociate - reassociates or associates dimensions to entities or points on entities. MLeader - creates multileader entities using the current multileader style. MLeaderEdit - adds leader lines to and removes leader lines from a multileader entity. MLeaderStyle - creates and manages multileader styles through the Drawing Explorer.